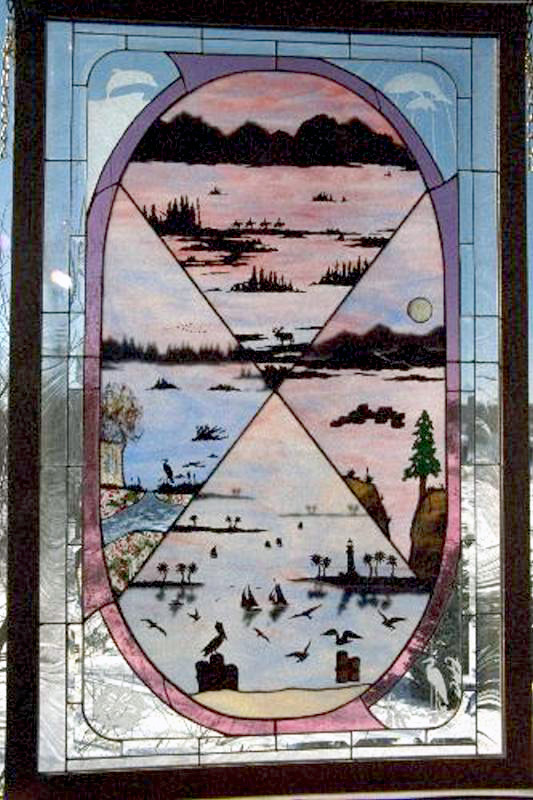 A custom-designed hanging window piece depicting a multitude of scenes and imagery. This piece showcases copper overlay and cut & leaded techniques. The nature of the piece changes as lighting conditions change throughout the day. Sold. Contact me for a similar piece. E-scape Art Glass by James A. Veenstra is inspired from two primary sources: the natural beauty of God’s unspoiled creation; and escape into the intrinsic beauty of nature’s landscapes, ecology, and environment, (i.e. E-scapes). All artwork © Copyright E-Scape Art Glass. All rights reserved.